The Orphaned Felbat drops from the Armies of Legionfall Paragon reputation reward box. Players that earn Exalted with this faction can continue earning favor, and will receive a cache for every 10k reputation earned after Exalted. 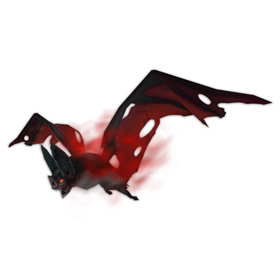 The Orphaned Felbat is an interesting lil guy from the Legion expansion. He has a few interesting abilities for a flyer that could make for some troubling situations for those that battle against you in pvp. Paralyzing Venom is one of his fun abilities that keeps control over the battlefield. Very helpful to interrupt key abilities. As a flyer, the odds of you going first is extremely high. I had much success running him for the Family Brawler Achievement. It appears to come from the bag you get after you hit exalted with Armies of Legionfall. The drop rate is most certainly low as I had 4 guildies (and myself) each open a bag, no pet. Anyone who got it should consider themselves lucky because this one appears as though it's going to take some time to get (like the paragon mounts). I do believe it is tradeable though. So this drops from the Legionfall Emmissary chest which you get from paragon rep. Hopefully the drop rate is higher then the one from Dreamers.